The audio of Suriya’s upcoming film Maatran, in which he’s playing conjoined twins, is all set to be launched in a grand way. The event is going to be held on August 9 in Singapore and buzz in Kollywood is that it’s going to be the biggest ever events in recent times. Already KV Anand, who has directed the film, has invited all the leading bigwigs in the industry and now Suriya has invited a slew of top actresses including Asin, Trisha, Nayanthara, Anushka Tamannah, Divya Spandana, Sameera Reddy and Shruthi Haasan who have acted with him for this audio launch. Suriya is going to be accompanied by his wife Jyothika in this event. 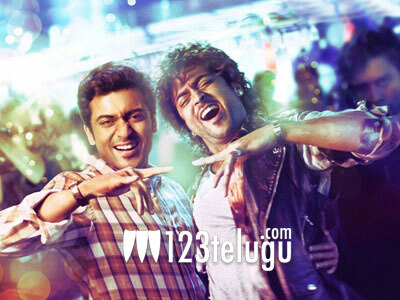 Suriya reportedly shot for over 2500 shots for the film which is probably a new record. Kajal Aggarwal is playing the lead role and two Russian actresses named Irina Maleeva and Julia Bliss have played important roles. Harris Jayaraj has composed the music for this action entertainer. Bellamkonda Suresh has bought the dubbing rights in Telugu and the Telugu version is likely to be named as Duplicate. Most part of the film was shot in Chennai, Hyderabad, Russia and East European countries. The film is likely to hit the screens sometime in September.